I love the rainbow stripes and the little dots made me (at first) think of enamel dots which eventually led to sequins. So I wracked my brain thinking of how I could create sequin stripes. As luck would have it, I still had this Papertrey Ink die on my craft table. I knew this die would be perfect to make a rainbow shaker! 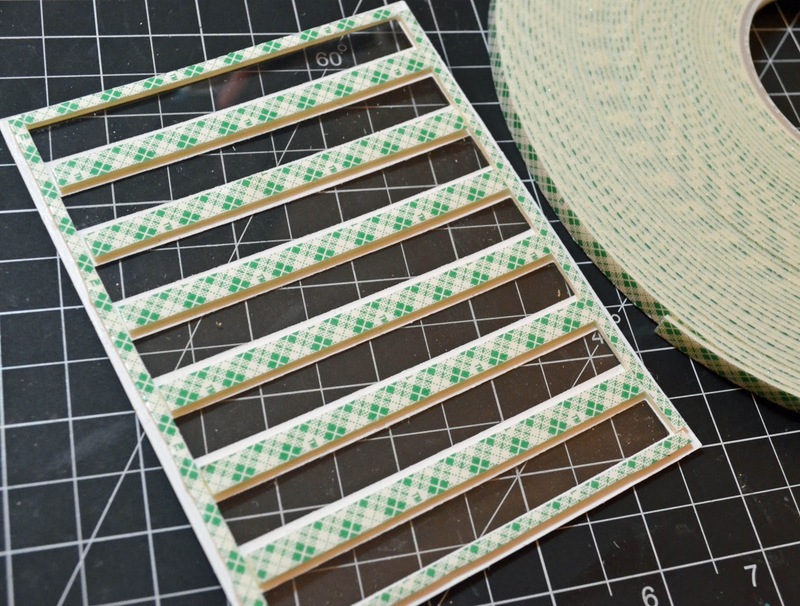 Among my supplies that I can't live without is my 1/4" wide foam tape. This stuff is an absolute necessity for gluing on small die cuts and for making shakers. You can see how it fits perfectly on the stripes. I only had to cut it in half to fit around the edges. I filled each shaker well with sequins (mixed whatever I had) and applied the card base to the back. I finished it off with a die cut "thanks" using this Lawn Fawn die. Really so much fun! Thanks so much for stopping in! Don't forget to comment on each stop of the blog hop to qualify for a chance to win a prize. The sponsors this week are Serendipity Stamps, Penny Black, and WaffleFlower (what a group!). The giveaway closes next Tuesday at 11:59 pm EST. Here's the full list of hoppers because you're not going to want to miss anyone! You make it look so easy. I just wish I had the amazing ideas that you have. Thanks for sharing, this card is beautiful! EEEK! A rainbow sequin shaker!! Brilliance at its best!! OMG this has got to be the coolest and most creative shaker card ever!! This is the ULTIMATE shaker card, JJ! Love it so much! Excellent shaking going on here! OMGoodness! You ROCK!!! Excellent shaker card with lovely sequins! Wow.This is fantastic.I agree with the others.This is the coolest shaker card I have ever seen. Totally amazing! Love, love, love this design! I don't think I've ever owned that many sequins - you make me want to place an order immediately! Oh, JJ! I cannot even tell you how much I love this card. It's perfect. Oh my goodness, how fantastic and fun is your card! I love the shaker, the pretty rainbow and the awesome way you put them together! Love your take on JM's card. It looks so neat! This shaker card ROCKS the Casbah! It's amazing and wonderful, just like you. Thanks for the endless inspiration! What a fabulous idea!! I love the shaker card you have created they are just beautiful !! WOW, WOW, WOW! I'm totally crushing over this card! Totally makes me happy and is such a nice break from the news of the hurricane slowly making its way toward our islands. Absolutely STUNNING! OMG those rainbow sequins totallly rock!!!!! love it love it! What a clever idea, love how it turned out! Fantastic card, thanks for tutorial i must try :D.
One of the most unique shaker cards ever! 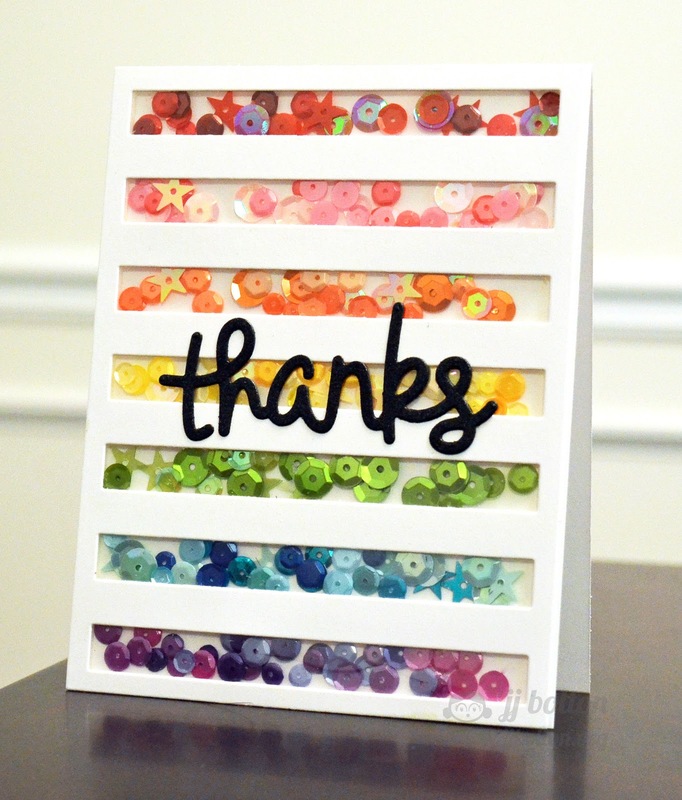 What a clever way to feature sequins in a rainbow of colors! Awesome shaker card! So creative!! Love your rainbow shaker card. So pretty. Love it! Super card with great idea. OMG!! I LOVE this!! Absolutely gorgeous! What a brilliant idea.. love all the different colors. Absolutely gorgeous!!!! LOVE IT!!! Wow! I can't get myself to do a shaker card, you've really topped it with the multi-coloured windows!! This is one awesome shaker card! So fun! Your shaker card is fantastic!! Wonderful job. J.J. this is awesome... would you believe I've never made a shaker card? That die really did make it wonderful! Thanks for sharing! OMGoodness this is fun! Love the sequins in rainbow! I want to shake, shake, shake! WOW - a rainbow sequin shaker...fabulously pretty! Super cool...love that shaker card..great inspiration! Thank you for joining us in the celebration! You take shaker cards to a whole new level! Fabulous! This is the.coolest.shaker. card ever! Love the sequins and everything else about this card! Love this rainbow shaker!! So awesome!! this is a wonderful card - thanks for sharing - I would love to receive it - but don't think I would ever make it. 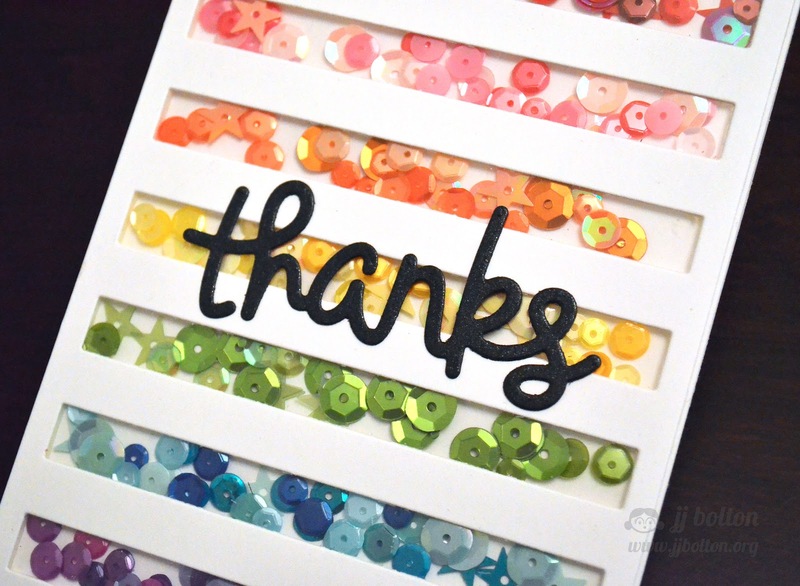 Rainbow sequin shaker - wow - so much goodness in one card! Love how colourful - and fun - your card is! It would look different each time you looked at it because of the moving sequins. Another GREAT card! Love the idea and thanks for sharing. You have made 7 shaker cards in one!! Not everyone would have the ability or patience. It is amazing!! What an amazing take on Jennifer's card! WOW! Okay, it's obviously amazing. Darn girl, you're so dang talented. Love this multi shaker card! Sequins make everyone happy! OMG!! Are you kidding me? I LOVE LOVE LOVE all these blingy colorful sequins - brilliant! Just brilliant!!! 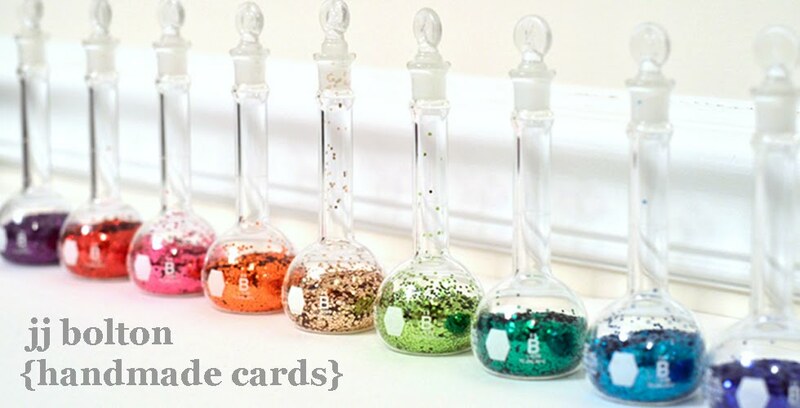 Fabulous shaker card.... what a fun idea with all those lovely sequins! Girl, you worked hard on this! I adore shaker cards and this one is simply amazing! SO cool, love your shaker card! LOVE, LOVE LOVE this!! What an ingenious idea! Thanks so much for sharing it! The shaker card is fabulous. Can't wait to try it! Love this & pinning it for future CASEing! Very cute! Love that the color layers were sequins! Love, love, love your sequin rainbow--maybe reminds your of the 'Bows back home, eh? My folks are Kama'aina, so we have 'Hawaii' in common. 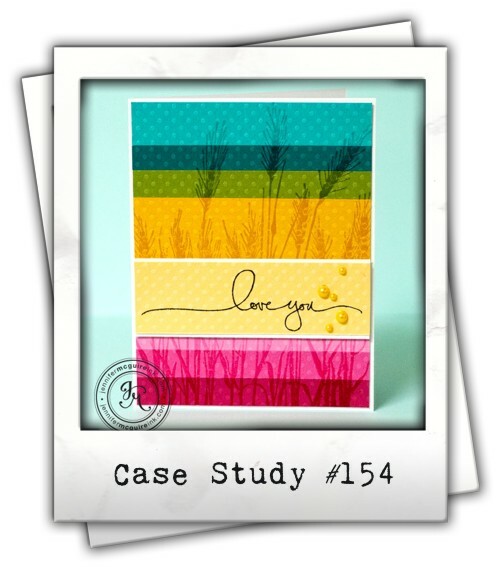 Thanks for sharing your inspiration and gorgeous card. This post just got you a new follower! Rainbow perfection and such a clever idea! What a stunning CASE. Perfection! 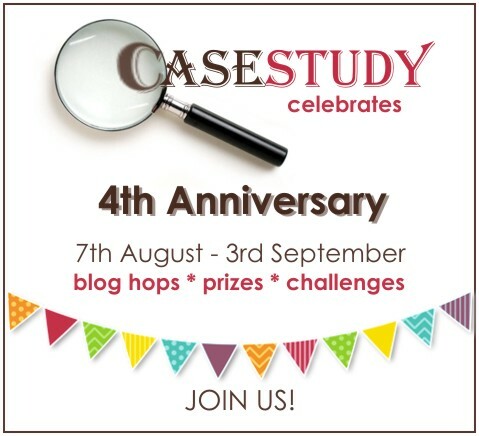 I can't believe it's taken me 4 years to discover CASE STUDY! What a fantastic design. So much colour and fun. Fantastic colorful card. I love it! WHat a colorful shaker card ,Loved it ! Ahhhh this is gorgeous and yummy at the same time! I love it! Fantastic shaker card JJ. Love the stripes and those pretty sequins. Stunning shaker card!! Beautiful colors!! Love all the sequins!! That is some serious foam tape shakering going on! Love this! Nice creative interpretation of Jennifer's card. Fun! This is so my favourite card so far. I loved the inspiration as I too am a huge fan of hers but for me although I love hers for me yours wins by a smidgen. Awesome shaker card with your very clever stripes! Beautiful colours. Now that is an impressive shaker card! FABULOUS inspiration, FABULOUS card JJ - loving all those sequins! love love love....worth the time it took to pull off that gem!! Your card is so fun and a great take on the inspiration photo. sweet mother of shaker cards! Love it, this shaker card has wonderful color, style and nails the inspiration photo. TFS. Oh my! There are shaker cards, and then there are shaker cards! Such an incredible take on your inspiration! Amazing card! Love everything about it! Lovely-- goodness, you used quite a bit of sequins!!! Very lever. I love both yours and Jennifer's cards. This shaker card is so cool!! Wow wow Wow! I love your shaker card! Awesome! So beautiful! Great take! You inspired me! Thanks for sharing how you make this card! absolutely amazing, i love it, i love it! An amazing card.... beautiful rainbow sparkles!! Love, love! Ooooooh! So pretty and shiny! I really appreciate you showing the backside also--I helps me understand your process! Wow! Now this is how you make a rainbow! Love it....You are so creative! Spectacular sequins with a great twist of a shaker card! My my. . How creative.!. . Its a functional card too. . This shaker card is so lovely and fun! Thank you, JJ, for the inspiration! this is such a beautiful shaker card... love your shaker elements..
Oh my goodness, this is a work of love! Very fun take. I LOVE this...now I just have to have this die.....the use of the sequins is fantastic!! WOW! This card is awesome! Love it! I just stumbled upon your blog through Pinterest, and boy, am I glad I did. I am adding you to my Pinterest board of favorite blogs and websites. Thanks for the chance to win, and for the inspiring designs! This is just such a fun card. I have to try to make one myself. I came across this pretty card on pinterest. Can you tell me where you purchased the foam tape? I can't tell from the picture but what did you use to keep the sequins from falling out. Is it clear acetate? Do you by chance have a video of this or a reference.